Bicycles are very popular with area visitors. The beaches of south walton have miles of paved bike paths. Visitors like to ride in the early morning hours, and in the cool of the evening. A bicycle is also great transportation once you are here. Ride your bike to the restaurant, shopping, and just for fun. Your Destin Bike Adventure Begins Here! Bicycles are a popular pastime with the visitors to our area. There are several bicycle rental operators at area beaches, and prices are very reasonable for a resort area. Bicycles give you an opportunity to explore your beach up close, and at a pace that allows you to see things you would miss in an automobile. 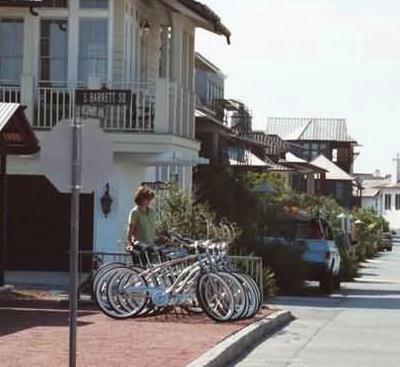 Rental bicycles at Rosemary Beach near Destin Florida. 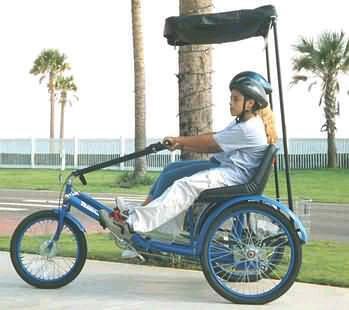 Cruisers are the most popular bikes, they are simple and easy to ride. Most area beaches have a local rental operator.